It’s like a Fitbit on steroids. 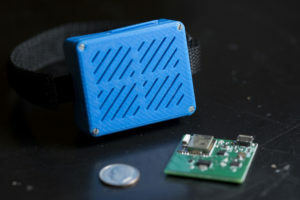 Researchers at Missouri University of Science and Technology have developed a multi-modal sensing device that can track the fine-grained activities and behavior of people with dementia — and it could help in Army combat training, too. 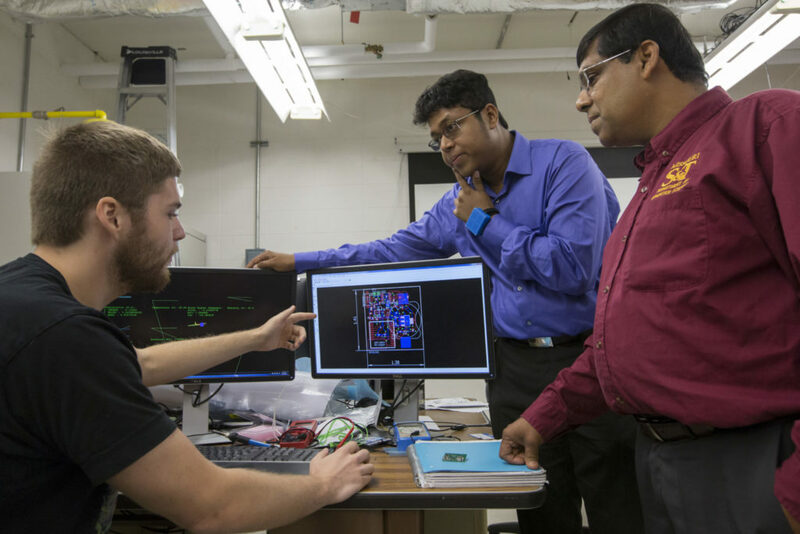 Dr. Debraj De, a postdoctoral fellow at Missouri S&T, and Dr. Sajal K. Das, the Daniel St. Clair Endowed Chair and department chair of computer science at Missouri S&T, created a wearable device for the wrist that can track a person’s movements, ambient environment, bio-signals and much more. In collaboration with Dr. Mignon Makos, a neurologist at Phelps County Regional Medical Center (PCRMC), the device is going to be tested for patient rehabilitation and routine evaluation. “The smart chair and the wearable device are new, noninvasive strategies for earlier diagnosis and represent a partnership among scientists and physicians,” Makos says. And, Das says, it might someday gain approval as a tracker during combat training at Fort Leonard Wood, Missouri. Looking like an oversized watch, the sensing device has four basic functions. Like a fitness tracker, it records fine-grained movement. It also measures the wearer’s direct physical environment for temperature, humidity and barometric air pressure. It also will track health status through heart rate, respiration rate and galvanic skin response (a person’s skin reacts to stimuli through the sympathetic nervous system, producing a weak electrical current that indicates the wearer’s emotional state, such as being startled or agitated, De says). Finally, the sensing device has a functions like GPS and communication with Bluetooth beacons in proximity for various location contexts. The multi-modal sensor data can reveal fine-grained user activity and behavior contexts, powered by machine learning-based analytics. The wearable device has real-time data communication and analysis capability. The entire system is designed to support body multi-positional sensing applications as well, where the device can be worn on other body parts. For those rehabilitating and those with dementia, the ability to track their fine-grained activities and behavior, measure their heart rate and locate them indoor or outdoor helps healthcare providers keep tabs on their patients. The GPS function is especially helpful with dementia patients, who can wander away from home and not know how to return. For the Army, the device has different functions, says Steve Tupper, Missouri S&T’s liaison at Fort Leonard Wood. “The device De and Das are working on would be part of a suite of technology the Army is very interested in,” says Tupper, who touted the tracker in early August at the U.S. military’s Aberdeen Proving Ground in Aberdeen, Maryland. It costs the Army about $80,000 to train each recruit in the 10-week course at the fort, Tupper says. With about 30,000 trained every year, that works out to nearly $2.4 billion. If a recruit has a concussion that debilitates them, they’ll have to be held back and go through the training again, Tupper says. But if the head trauma can be caught earlier, it could mean the recruit just needs a few days off before rejoining the training instead of taking the whole course again. That saves money. “If you reduce inefficiency, you start to drive the cost down,” Tupper says. There are other benefits to such a device, he says. With the heart rate monitor, respiration tracker and GSR functions, it can see if a recruit is gun shy — afraid and hesitant to squeeze the trigger during rifle training — because of the recoil or noise when it fires. It also could study soldiers’ physiological responses for traumatic brain injuries or if they’re exposed to pathogens and how they respond, such as twitching eyes or ragged respiration, Tupper says. Although De’s device is currently constructed for wrist wear, smaller versions could be implanted in dog tags or a uniform. Ultimately, the goal is to make better soldiers. Designing and manufacturing the device is partly supported by a Missouri S&T Innovation Grant, which was awarded to De in February during his presentation at a Miner Tank event. The work with PCRMC is part of the Ozark Biomedical Initiative, a partnership between Missouri S&T and the hospital, designed to promote collaboration in research and education and to facilitate the exchange of ideas. Alec Bayliff, a graduate student in computer science from Springfield, Missouri, helped with the device’s design. Cameron Scholten, a freshman in mechanical engineering from Garden City, Missouri, contributed to the wearable enclosure’s 3D design, which was printed on the Curtis Laws Wilson Library 3D printer on the Missouri S&T campus. Great work Dr De, Dr Das, and others. The multi-disciplinary collaboration is so important to industry and innovation – the Mech Engr design, 3D printing, etc, and the collaboration with the Army and the interface with medical center for the clinical aspects. Wishing that I could be back at the university with all these exciting research and innovative programs.